UberMenu 3.3 was released on July 10, 2017, with a variety of new feature updates and enhancements. Out of the box, when you create a Tabs block, all tab content panels will be sized to the height of the largest panel. This provides the best UX for scenarios where the content in each tab is relatively balanced. In some cases, the content within the tabs can range widely between tabs – one tab may require only 150px of height, while another may require 500px. By default, all tabs in this tab block will display at 500px height. With the new Dynamic Tabs Sizing feature, as the tab toggle is activated, the entire tabs block will change height to match the height of the current tab content panel. Animations can also be enabled or disabled for this setting. In addition, you can now have static (non-toggle) items in your Tabs panel – useful for headings or separating links in the same column. Custom Styles. 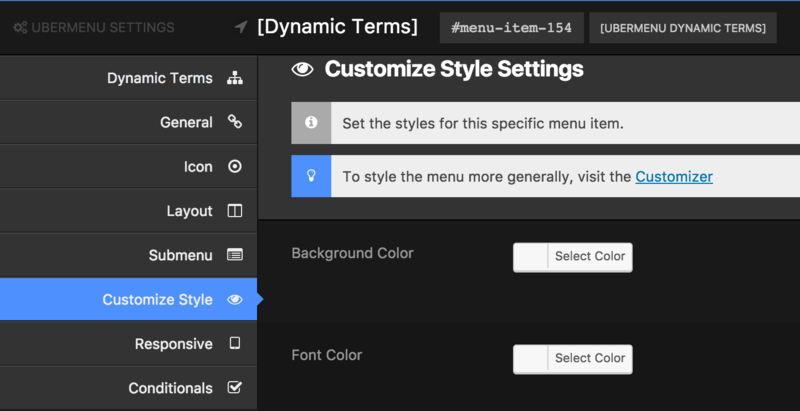 You can now set custom styles on a group of Dynamic Terms. Custom Anchor Class. You can now add custom anchor classes to both Dynamic Terms and Dynamic Posts for further customization ability. Custom Empty Results Message. If you set up a Dynamic Terms or Posts query that may return 0 results, you can now set up a custom message to display to the user in that event. Top Level Line Height. Adjusting the line height of the top level items is often the simplest way to equalize the heights of items with varying content sizes, assuming all text appears on a single line. Description Hover Color. Change the color of your description text when the item is hovered. Tab Toggle Current Background and Font Color. Adjust the colors of the tab toggles when they are current. Rows now have independent Submenu Column Divider settings so that each row can be controlled individually. 3.3 also includes a variety of other enhancements and fixes. For the full changelog, visit the UberMenu product page on CodeCanyon. Questions? Please Submit a Ticket (existing customers) or a Pre Purchase Question (new customers) and we’ll get back to you as soon as possible. This entry was posted in Announcements, WordPress. Bookmark the permalink.